Herman picked us up at 7:00 a.m on December 11th and we enjoyed the ride through historic Cartaga, traffic-bound San Jose, and the coast mountains, arriving about noon at Villa Lapas, our final destination. Although we arrived at noon, as scheduled, the Hotel enforced a misguided policy of not allowing us to check into our rooms until 3:00 p.m. (They were not anywhere near full). We managed to clean up and change clothes in the public rest rooms on premises and walk the hanging bridge trails from 2:00 until about 5:00. The next morning we started early again, driving the short distance to Carara National Park. 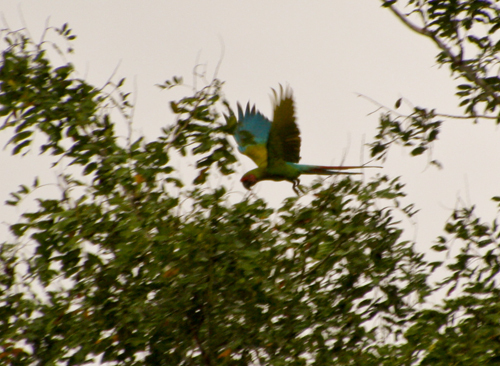 Almost immediately we could hear the raucous calls of Scarlet Macaws. 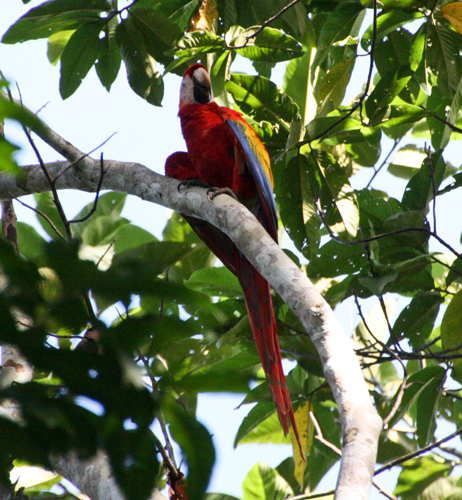 Within minutes we were observing multiple pairs of Scarlet Macaws as they squabbled raucously over nesting hole claims, and otherwise made their presence well known. A troop of Spider Monkeys ambled along among the topmost branches of the jungle, pausing from time to time to taste the flowers. We also spotted a Capuchin Monkey high in the leaves, but he stayed hidden from our camera lens. 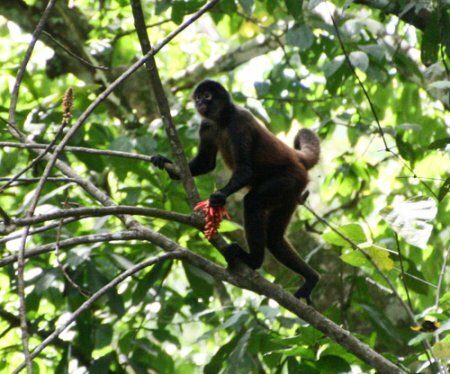 This brought to three the species of monkeys that we saw, and, in the case of the Howler Monkeys, heard. After the walk at Carara we returned to the hotel grounds, which are quite extensive, for some unguided birding and some rest. The air conditioning in the rooms was most welcome, as the humidity and heat hit us hard after experiencing the coolness of the interior mountains for the prior 4 days. After siesta, we took a riding tour of the local villages, the sea shore and the farms, all the while looking for birds. Not much new was seen, but there were a few interesting shorebirds and other water-oriented species along the shore, and other interesting species in the country-side. Among the more interesting birds seen during our stay at Villa Lapas were several Bare-throated Tiger Herons, Magnificent Frigatebirds, two Caracara species, Laughing Falcon, Crested Guan, Orange-chinned Parakeets, a Blue-throated Goldentail, and Blue-crowned Motmots. Also found here were Barred and Black-hooded Antshrikes, Blue-crowned and Long-tailed Manakins, Rufous-naped Wrens, Yellow-crowned Euphonias, a Long-billed Gnatwren, and others, for a total of about 75 species, none of them, however, new to me. 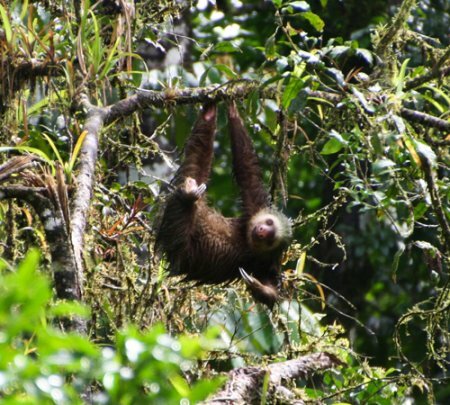 Costa Rica is a beautiful, friendly, country. I can’t think of a better place for a beginning birder to initiate his or her out-of-country birding experiences. This second visit to the country was as comfortable and enjoyable as my first, over 10 years ago. We arrived at Savegre Mountain Lodge in mid-afternoon on December 9th. This is an attractive facility with excellent and extensive gardens surrounding. Hummingbird feeders and a couple of other feeding stations attract a good variety of birds so that a mid-afternoon arrival is blessed with some interesting birding despite the lateness of the day. After a bit of birding we freshened up in our “Junior Suite”, where I was able to start a fire in the fireplace to dispel the chill. 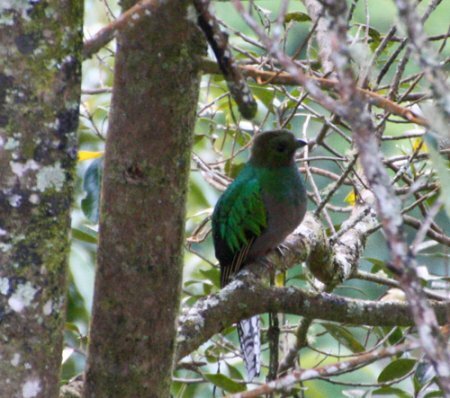 When we went to dinner we were met by our assigned guide for the next morning, Melvin Fernandez, who suggested we make a very early start in the morning in order maximize our chances of seeing our target bird, Resplendent Quetzals. We readily agreed to meet him at 5:45 a.m. He reviewed my list of never seen birds that can be found in the area (about 35), and indicated he would make an effort to find as many of those as possible, after the Quetzal outing. 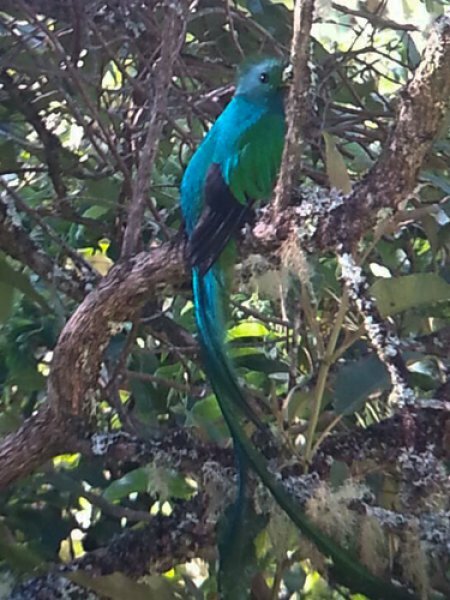 Next morning, after a short drive from the Lodge, we climbed a steep but short trail to settle in on a ledge overlooking an extensive valley and a nearby fruiting tree which attracts the Quetzals to their breakfasts. It did not take long for a female Quetzal to show up at the tree, where it remained for the entire time we were there. A half an hour or so later, a male Quetzal also flew into the tree and Adam was able to get a number of pictures of this beautiful bird. Several others were seen flying at a distance. The male Quetzal is arguably the most beautiful bird in the western hemisphere. When I was a child in country grade school, there was a stack of old National Geographic magazines in the “library”. 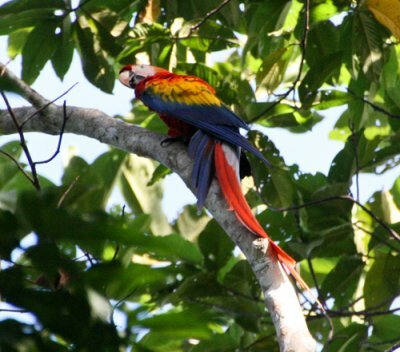 In one of them I found a picture of a Quetzal, which I cut out of the magazine and took home to paste in my scrap book. It was the prettiest bird I had ever seen and I thought that if I could ever see one in the wild, I would have achieved Nirvana. 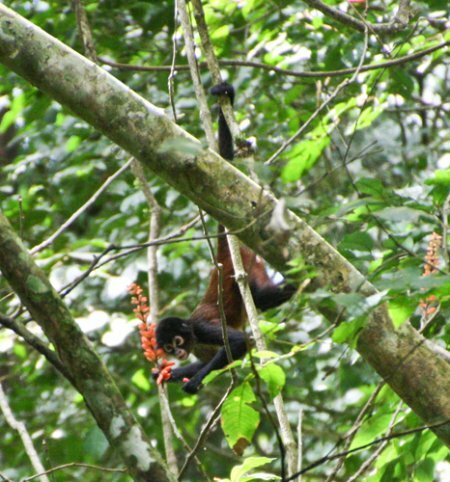 I did see a couple of them when I was at the Monte Verde Cloud Forest in Costa Rica over 10 years ago, but the weather was wet and foggy and the sighting was not very satisfying. This time was different, with beautiful morning sunshine, crisp and dry air and close-up views of both sexes of this iconic bird. We were very happy to achieve success with this, our number 1 target of the trip. Melvin then led us on a long but manageable hike in the forest and along a small river. At the end of the day, I had seen 19 new species, by far the most of any of our stops. Melvin had memorized my list after a few minutes of looking at it the night before, and he succeeded in finding far more of them than I had ever anticipated. He is a great guide. Among the new birds were the lovely little Flame-throated Warblers, Black-cheeked Warblers, a Wrenthrush (Zeledonia), Sooty-capped Bush Tanagers, Yellow-thighed Finches and many more. New Hummingbirds were Volcano and Scintillant Hummingbirds and Gray-tailed Mountain-gems. Early the next morning we were met at the lobby by German (Herman) Vargas, our driver/guide who had delivered us to Savegre and who would accompany us for the remainder of the trip. The last stop on our tour would be Villa Lapas Hotel near the Carara National Park, along the mid-Pacific coast of Costa Rica. 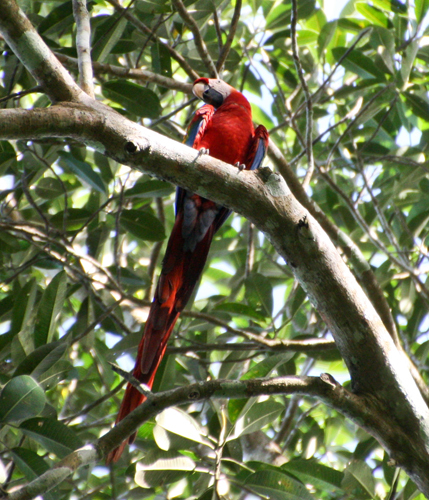 There we hope to find Scarlet Macaws, our number 2 target bird of the trip. Days 3 and 4 in Costa Rica were occupied by travelling to Rancho Naturalista in the Tuis-Turrialba region of the Talamanca Mountains. 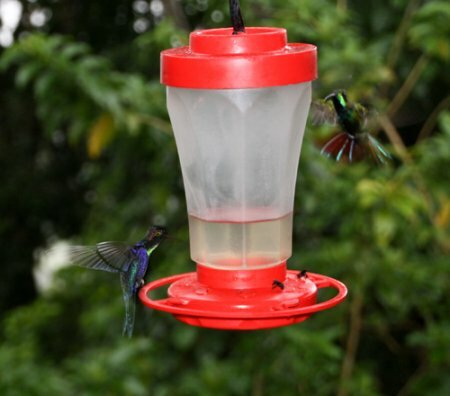 The staff, headed by birder extra-ordinaire, Harry, welcomed us and we were quickly seeing many Hummingbirds attracted to the lodge by feeders and observable at very close range. Hummingbirds seen included three new life birds for me, Green-breasted Mangoes, Snowcaps and Red-footed (the new name is Bronzy-tailed) Plumeleteers. Others present, many in substantial numbers, included Green Hermits, Little Hermits, Violet Sabrewings, White-necked Jacobins, Green Thorntails, and Violet-crowned Woodnymphs. Other hummingbirds found at Rancho Naturalist were Rufous-tailed Hummingbirds, Green-crowned Brilliants, and Purple-crowned Fairies (12 species in all). Aren’t the names amusing? And often very descriptive. The hummingbirds were definitely the highlight at Rancho Naturalista. My first sighting of a Snowcap (a hummingbird) occurred as dusk was descending soon after our arrival, and three of us followed Harry into the even darker woods where we looked down into a deep ravine with a number of small pools. As we watched from above, both a male and a female Snowcap came to bathe in the pools, dipping in and out like dragonflies. Another excellent sighting at the pools was a very cooperative Tawny-throated Leaftosser, which kept us entertained with its bathing forays into the shallow pools. Darkness finally forced us to return to the lodge for a delicious dinner, (especially the dessert) served family style to the 8 or 9 guests. 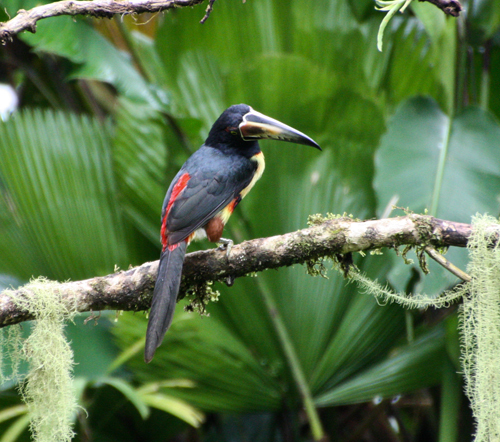 The feeders outside the lodge attacted many lovely birds including both species of Tourcans and this Collared Aracari. Early in the morning of our departure day, we walked to a large canvas that was stretched between some trees and lit with bright lights during the pre-dawn hours, attracting hordes of moths and other insects, which, in turn brought in a good number of forest birds looking for an easy meal. These included a couple of new birds for me: Plain-brown Woodcreepers, and Tawny-chested Flycatchers. Rancho Naturalista produced a total of 73 bird species, of which 10 were new to me. On the way to our next Lodge on the morning of Day 5 of our trip, we stopped at Mirador Quetzales. This was a stop both for lunch and to hike the mountains in the area for a couple of hours, primarily for the purpose of seeing a Resplendent Quetzal, just in case we were to miss them at our next lodge, La Selva, where sightings are generally more predictable. 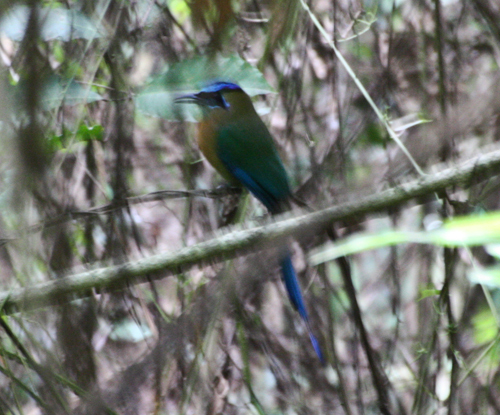 The hike was taxing and did not produce a Quetzal although we did see a good number of other birds. We arrived in mid-afternoon at Savegre and we were pleased and surprised at the beauty of the gardens and general setting. Part 3 of my Costa Rica report will describe our excellent experience at this lovely facility. Days 1 and 2: Selva Verde Lodge, La Selva Biological Station, and the Sarapiqui River. My son-in-law, Adam, and I went to Costa Rica on December 5th to spend 8 days birding in 4 locations. Our first stop was the Selva Verde Lodge near La Selva and the Sarapiqui River. We were doubtful of taking our scheduled boat tour on the river because heavy rains the week before our arrival, (and while we were there) had caused the river to rise, and as we saw the brown, swirling waters speed past our lodge, we were somewhat fearful of it. Our guide, Ivan, assured us that the boat we would be on was river-worthy and that it was covered so that we would not be drenched from above during the tour. We trusted his judgment and we were very glad we did. The river cruise was the highlight of our visit to La Selva. In addition to the many birds seen during our morning cruise on the River, we were treated to great views of both Three-toed and Two-toed Sloths, hanging out high above the River. Green and Orange Iguanas appeared clinging to the trees along the river. The birds included a lovely Rufescent Tiger-heron, several Green Ibis, a Long-tailed Tyrant (my first), Mangrove Swallows, Buff-rumped Warblers, a Black-cowled Oriole, and many others. Notably absent: crocodiles, perhaps out of view due to the high water. Back at the Lodge, large numbers of birds and animals were attracted to the banana feeder just outside the dining area, where we could sit with our coffee or tea and observe their coming and going at close range. 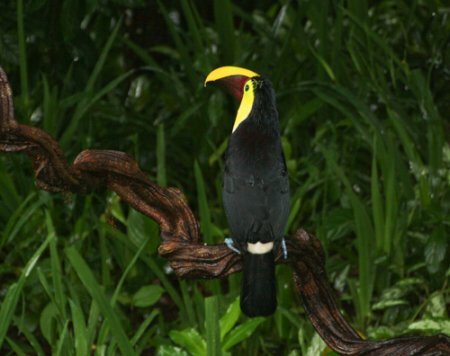 Among the more spectacular of these were the Black (Chestnut) Mandibled Toucans. 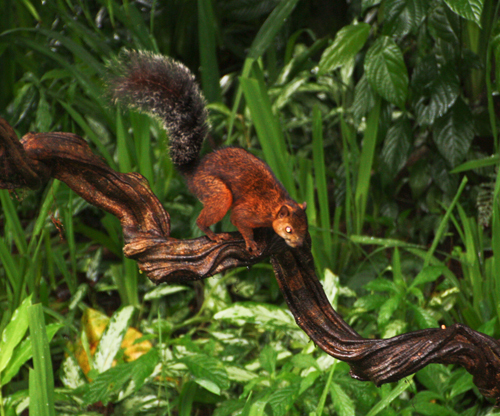 Passerini’s, Blue-Gray and Palm Tanagers, Olive-backed Euphonias, Yellow-crowned Euphonias, and numerous other birds competed for the bananas at the feeder, but were usually out-performed by the Coati and the numerous Variegated Squirrels who knew where to come for an easy meal. A visit to the La Selva Biological Station (in the rain) produced the new bird of the trip for me, a Snowy Cotinga, unfortunately at a distance and in mist. Peccaries showed up as we completed our rain-drenched tour. Heliconias Island was on our agenda, and we arrived early afternoon, to intermittent rain and a generally disappointing experience, probably the least interesting destination of the entire trip. Following our truncated and soggy walk around the deteriorating premises, our driver/guide took a side-trip “off the beaten track” in the agricultural country-side on a successful foray to find a rare and endangered Great Green Macaw. 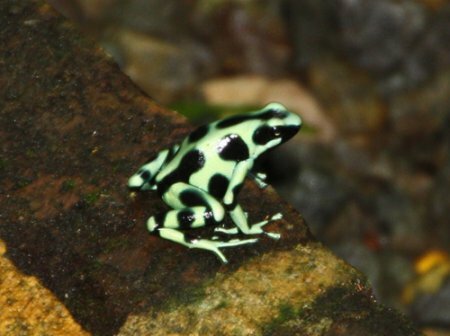 On the pathway between our rooms and the dining area we encountered several Green Poison-arrow Frogs. In summary, this was a very good destination with good facilities, good guides and good food. We listed a total of 90 birds during our 2-day visit (probably a low count due to the constant rain), of which 4 were life birds for me: (the Snowy Cotinga, Great Green Macaw, Long-tailed Tyrant and a Long-tailed Hermit). The mammals and frogs provided added interest. The lesson we learned is that rainy weather should not dampen the spirits of a couple of intrepid birders. 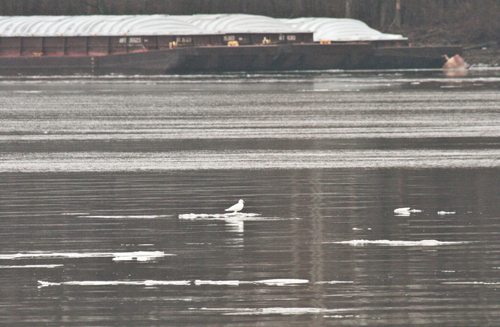 Late in the afternoon of January 2, 2015, the bird hotlines came alive with reports that an Ivory Gull was seen on the Mississippi River in Quincy, Illinois. This ABA Code 3 bird has long been on my wish list, but my expectations of ever seeing one were lessening every year. My research indicated that the probable best place to find them was at Barrow, on the northern shore of Alaska in the fall. Not a place that I was anxious to go to in the fall, especially since the chances of seeing them well there were not very good in any event. The Ivory Gull is of concern for its long-term survival because of the loss of the frigid habitat that it requires. The liquidation of the ice in the Arctic is affecting not only the Polar Bears and other ice dependent creatures, but the few species of birds that depend on that environment for their specialized mode of survival. These are the most northern nesting birds in the world. And so I was becoming quite pessimistic about ever seeing this, to me, most beautiful of all the North American gulls, with the possible exception of Ross’s Gull, which can claim its own stake to beauty. Unfortunately the weather forecast called for freezing rain in the Quincy area on January 3 and blizzard conditions here in Des Moines on the evening of January 3. Nevertheless, I convinced Barbara (it really took very little convincing) that we should make the 4 hour trip from Des Moines to Quincy the next morning, for what well may be my last chance to see an Ivory Gull. Fortunately the temperature stayed at or above freezing all the way to Quincy, so the fog and drizzle were inconveniences but not dangers. We arrived in Quincy about noon and stopped at the last place where the bird had been reported: on the river near the Pier Restaurant parking lot. There were no birds there. Other sightings had been between the Restaurant and Lock and Dam 21, several miles to the south. We found Lock and Dam 21 and there were a few birders there with scopes set to look north from the road. With a little help from the bystanders, I was able to pick out a white spot on a small ice floe far to the north, shrouded in fog and mist. It gradually floated nearer to us, but as it was becoming identifiable, it decided to fly back up river. We took off in the car to try to find a better viewing spot. Much of the river bank is closed under private ownership, but we were able to locate a couple of accesses between the dam and the Restaurant on the east shore. No luck. We drove back to Lock and Dam 21, and no one was there. Obviously, the birders had found a better viewing site so we returned to our efforts to find the right viewing site along the east shore. 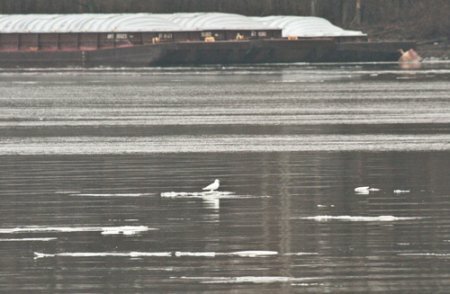 We finally spotted a number of birders in a small parking lot along the river and as we pulled to a stop, the bird soared past us within feet, as it pulled a small fish from the shoreline and flew to a floating ice island to consume it. Barbara was really disappointed that we arrived too late to get a real close-up of the bird as it flew near shore. However, the currents were with us and the bird floated past at a reasonably close distance, and I was able to get terrific scope views of the all-white plumaged gull with the black eyes, black legs and feet, gray bill and yellow bill-tip. Here are a few of Barbara’s photos of my long sought after Ivory Gull, number 738 on my North American Life List. An interesting side note to our trip was the concern expressed by the Missourians among the birders present, as to whether the bird was on the Illinois side of the river or on the Missouri side of the river. 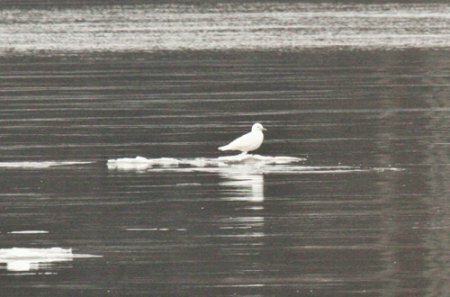 Never before has an Ivory Gull been seen in Missouri. The Missouri birders were very anxious to be among those who identified the first Ivory Gull ever seen in Missouri. I believe the consensus was that the bird at least flew over the Missouri side of the river, so perhaps the Official Birding Judges of Missouri will approve this as a verified sighting in their state. 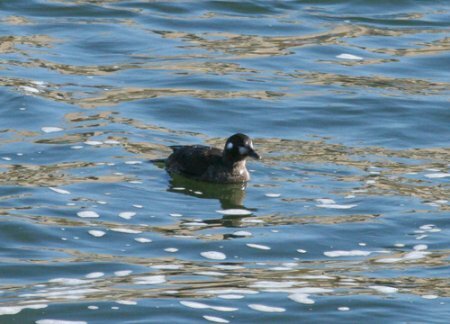 In November I saw hundreds of colorful breeding plumaged Harlequin Ducks in Adak, in the Aleutian Islands, but never before have I seen a Harlequin Duck in any plumage in Iowa. 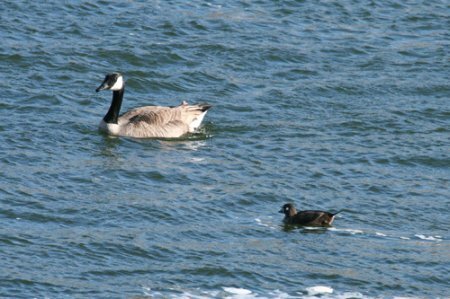 This plain jane “Harley” showed up in Des Moines below the Center Street Dam in late December and continues to inhabit our local waters. I wonder where she will go from here? Birds found so far out of their normal territory are always of concern for their ability to find their way home. The size difference is noticeable between the Harlequin Duck and the Canada Goose.